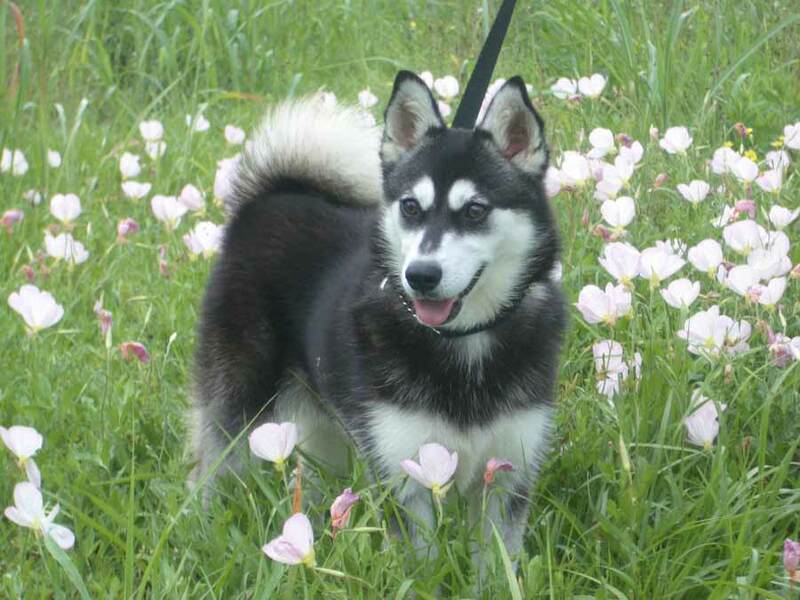 The Alaskan Klee Kai (AKK) was developed in the 1970s and ’80s, using the old Alaskan Husky as the foundation breed. The Siberian Husky and some smaller dogs of similar conformation were also used. The goal was a smaller-sized husky-type dog breed that would be an excellent companion dog. Today’s Alaskan Klee Kai has the appearance of a northern breed, with a wedge-shaped face, prick ears, a sturdy body, and a tail that curls over the back. The face has a distinct and striking mask. The coat is a double coat, with a dense undercoat and longer guard hairs. The toy stands up to and including 13 inches at the shoulder; the miniature is over 13 inches and including 15 inches; and the standard is over 15 inches and including 17 inches. During most of the year, the Alaskan Klee Kai breed can be brushed two or three times a week; however, during spring and fall when shedding is at its heaviest, daily brushing may be needed. With his sled dog heritage, the Alaskan Klee Kai can be quite busy. Without daily exercise, he may be prone to trouble. A couple of good walks every day and a jog with you or alongside a bicycle will keep him happy. This breed is also quite playful and thrives in many canine sports, including sledding, skijoring, agility, flyball, and flying disc. Many have also made excellent therapy dogs. Although training is important and should begin young. Alaskan Klee Kai puppies will never be as compliant as some other breeds. They do enjoy the attention that training provides. Early and continuing socialization is vital, as these dogs can be wary of strangers. The Alaskan Klee Kai is an excellent watchdog, yet is affectionate and loyal to his family. He will do best with an owner who understands the northern breeds. He is good with children who treat him gently and with respect; he will not tolerate rough handling. He has a strong prey drive and should not be trusted with smaller pets. The breed tends to be healthy. Share your Alaskan Klee Kai story. Note: Upload only Alaskan Klee Kai picture or your picture with Alaskan Klee Kai below - spammer's ip may be blocked.